It never fails to surprise me how famous the mannequin is that stands stoically, through rain and shine, outside the Mackay's store. Dickie the mannequin is notorious in Cambridge, and held with a great fondness by the locals. There is also a shared belief that he is actually a 'real' person, and whenever I substitute for him, and come to life, this belief is only reinforced as I always hear "I always thought you were a real person". One of the reasons for my visit was to try out some new make-up that better matched Dickies skin-tone. I had bought some clear liquid latex, and a powder colourant additive in ivory. The new make-up worked well visually but needed a lot of the colourant to make the colour strong enough, and took longer to put on as it was thinner, and consequently required more layers to be applied. It was pouring with rain, so no opportunity to stand outside to test the new make-up. We did however re shoot some of the building of the tower sequences, that I did last time. 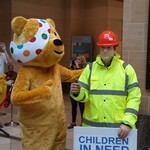 I'd also heard that my piece shot of me dancing for Children in Need with Naomi from www.dance-matters.co.uk was on their website, and that Naomi would be dancing with Pudsey at the Grand Arcade shopping centre for children in need. Neil Mackay, the MD of Mackay of Cambridge, very generously offered to match any donations to Children In Need, so we popped down to the shopping centre, and I stood taking donations and "surprise selfies" to great reactions. Great atmosphere, Great Day !